Everything changed when Helen Naraine had her first daughter. Having tried for years to become pregnant, she and her husband were overjoyed when their bundle of joy arrived in 2013. However, after returning from maternity leave she felt that something was off. “I absolutely loved my job as a teacher but started to feel a little bit disheartened with how the education system was changing,” she says. Moreover, with years of longing for a child of her own, Naraine didn’t want to be away from her daughter more than necessary. “I wanted a flexible work-life balance so I could see Sophia as much as possible,” she says. 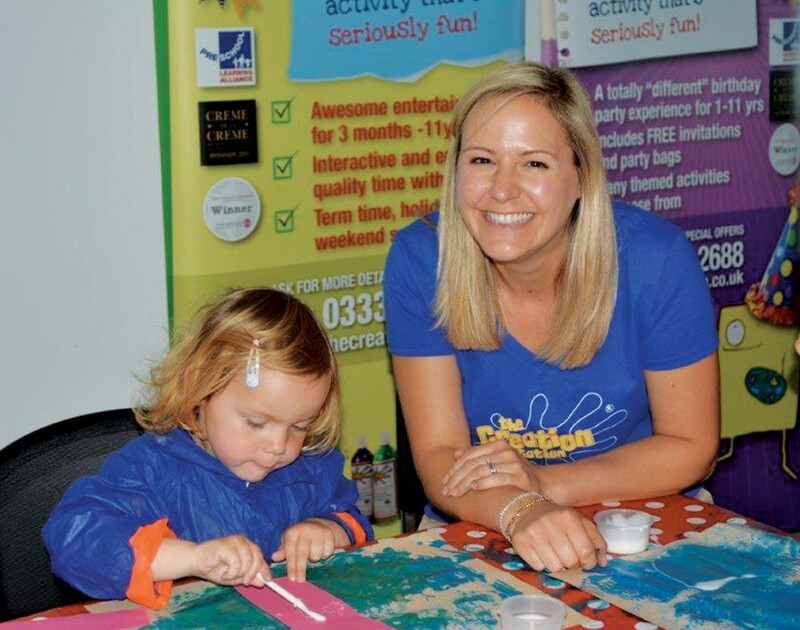 Naraine eventually found the missing piece to solve her life puzzle by becoming the franchisee for The Creation Station Sutton Coldfield and Lichfield, the arts and crafts franchise. Although, initially it wasn’t obvious it would be the network for her. Indeed, when she first started investigating franchising as a way of acquiring a better work-life balance, Naraine looked into several child tutoring franchises. “I wanted something that I already had some expertise in,” she says. “Obviously I had been trained as and spent most of my career as a teacher and as an early years specialist. And that’s where my love really lies. I love teaching.” But even though she looked into other networks, she was impressed by what The Creation Station showed her when she talked with them at the National Franchise Exhibition at the NEC in Birmingham in February 2016. “It really jumped out at me,” she says. But confident as the budding franchisee was that joining the network would provide the work-life balance she coveted, Naraine still did her due diligence. “I was doing my own research,” she says. This included talking with the company’s head of operations and with other franchisees. These conversations strengthened her conviction that The Creation Station was the right opportunity for her. Not only did the franchisor impress with its ability to keep innovating and modernising the brand but Naraine was also encouraged by the support on offer. “It was exactly what I had been looking for,” she says. Having signed the dotted line, she happily embarked on the company’s rigid initial training. “You go down to the head office in Devon for a week’s training, which is fantastic,” Naraine says. During these intense days she learned how to set up her business, run the sessions and market the company. Moreover, it also immersed her into the franchise’s culture by helping her build relationships with the people at the head office and with other franchisees. “It made me feel very comfortable,” she says. With the training done and dusted, Naraine launched her business in Sutton Coldfield in June 2016. Eager to make a success of her new venture, the fresh franchisee set out to find her first customers. Fortunately, she already had a few leads. “As soon as my Facebook page went live I think I had 21 enquiries,” she remembers. “So even before I’d even launched I was getting enquiries coming through.” But rather than settling with these leads, Naraine didn’t rest on her laurels to find more people to join her classes. To extend her client base she did a lot of leafletting and networked with local businesses. Although, the biggest source of inbound business has been how satisfied customers have helped spread the word. “The word of mouth has been fantastic,” she says. And it’s safe to say these efforts paid off. “I still have customers with me now that started coming with me back then when their babies were four months old,” she muses. “They are still coming back for classes even now. Older siblings have moved on through primary school and are coming back for the holiday workshops that we do.” This success has not only enabled her to add the Lichfield territory underneath her umbrella but has also hired three employes. And her success didn’t go unnoticed: The Creation Station named her New Franchisee of the Year at the annual conference in early 2017. “It was absolutely amazing to be recognised for all the hard work I’d put it,” she says. Despite the success, Naraine never lost sight of her main objective. “The biggest challenge was to remind myself why I went into this in the first place,” she says. That way she made sure to not rush into things and to ensure she held back if it seemed as the company would keep her from spending time with Sophia and her second daughter Francesca, who was born in the autumn of 2017. “So the main challenge was holding the reins and to keep the business moving forward,” Naraine says.